housing and strata blocks, which limits hardwired home security. Whether you rent, lease or in temporary housing, the Envoy Wireless Home Security Package from Patrol Hawk provides the perfect solution in home security. Having safely secured thousands of people with our state of the art alarm and monitoring packages, you too can benefit from the expertise at Patrol Hawk and have real peace of mind knowing your home is in safe hands. The burglar alarm panel system G50E adopts SMS data transmission and voice platform of GSM network to send control command and receive alarm remotely, which is designed for house, office, supermarket etc. It will call & send alarm SMS to user cellphones immediately when any sensor is triggered. The system can also be used as handfree mobile phone for two-ways communication. The LCD on the alarm Main unit can show the time, data, operation guide, alarm details and status of arm, disarm, GSM signal, power etc. With the LCD, all the operation and program are visual and intuitive. The system with human kind voice guide and can be recorded into all different kinds of languages and work well all over the world. 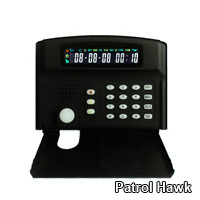 -Maximum 4 wireless panic buttons, 4 wireless fire detectors, -16 remote controllers, 32 wireless intruder detectors. -Maximum 8 wired zones. Zone 1 and zone 2 for wired door/window magnetic contact, which will remind you if the door/window is open. -Send alarm SMS to 5 preset mobile phone No. -Auto dial 5 preset user phone No. -Forward mobile company SMS to user automatically. -Work with monitoring center, such as police station. -Zone classification prevent inside thieves effectively. -220 wireless address encode reduce the rate of same code greatly. -SMS modifies wireless zones name. -Call the main unit to listen in status whenever. -With internal MIC and speaker.